Powerful Dwarf. 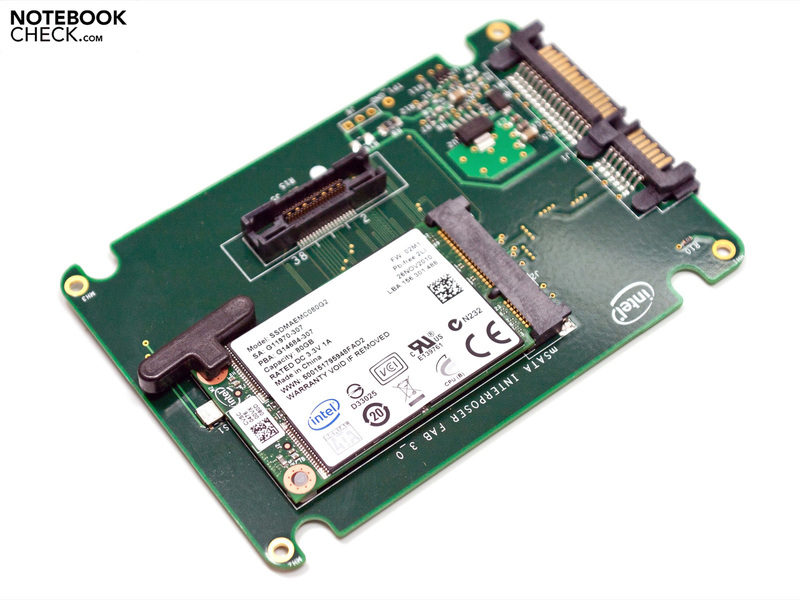 Besides drives in 2.5-inch size the new SSD product range from Intel also comprises the 310 series, i.e. 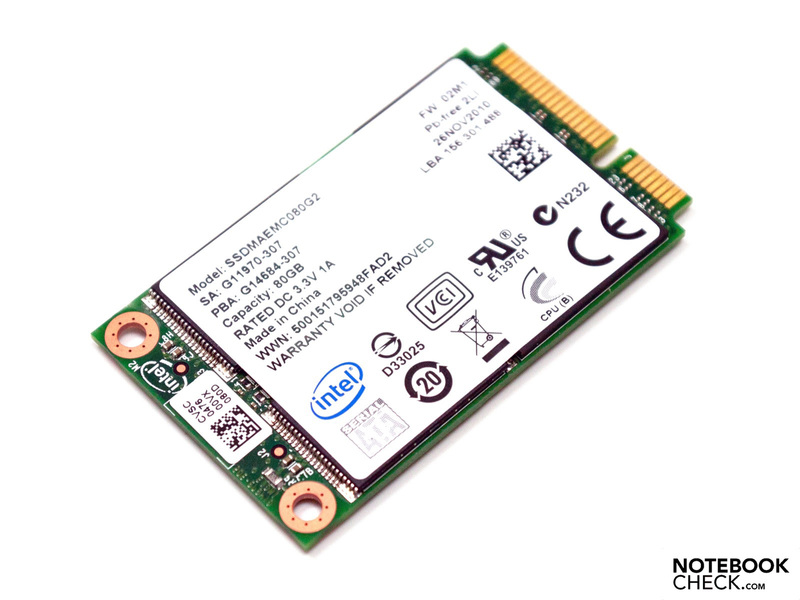 SSDs in mSATA shape. The devices only weighs 7 gramme and its maximum read transfer rate should be 200 MB/s. Currently, you can choose between models with 40 and 80 GB capacity. We benchmarked the 80 GB model. Fast hardware does not necessarily need to be big. 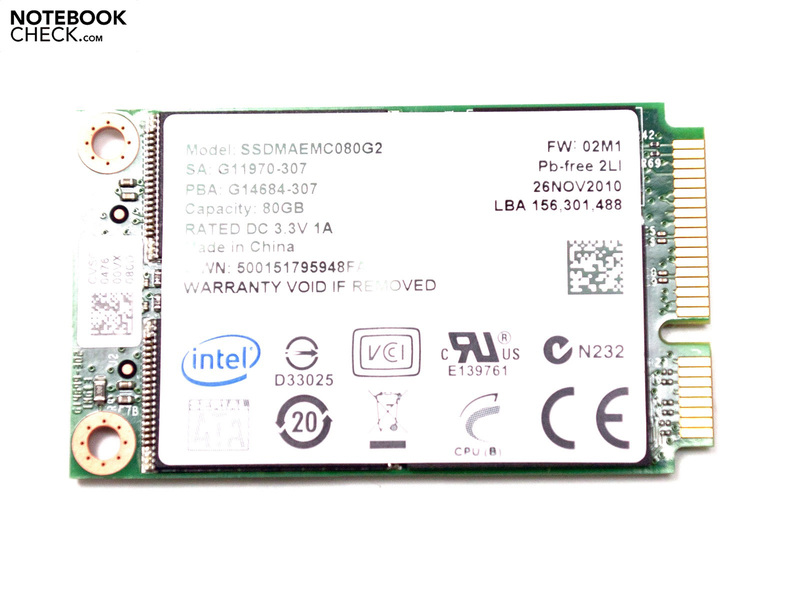 This is proved by the new SSD series 310 for mobile devices, e.g., laptops, netbooks or tablets. On a printed circuit board of only 50,8 x 29,9 x 3 – 4 millimeter (B x T x H) size, there is a complete Solid State Drive (SSD) of 40 or 80 GB capacity. Another advantage of this component is its small weight of only 7 gramme. A PCI Express Mini card slot which supports mSATA (SATA 2) data transfer, is required. 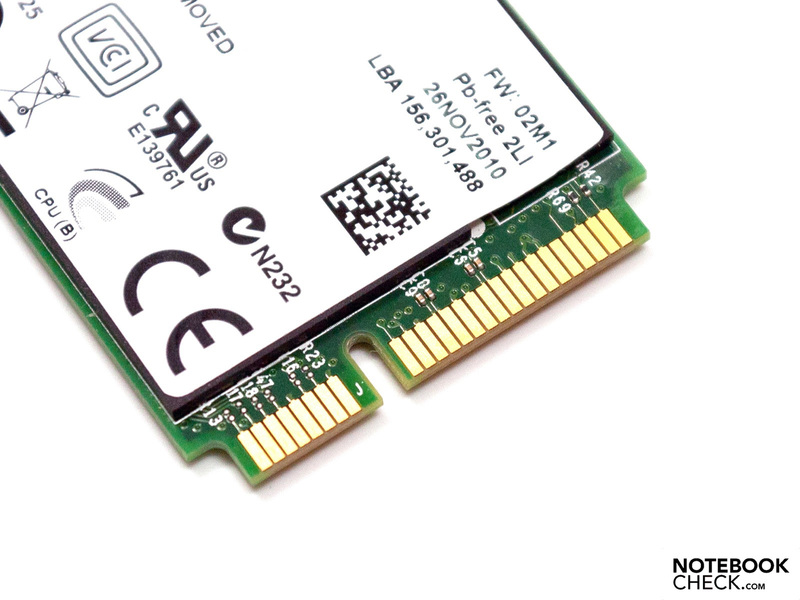 The article from StorageReview.com explains that it is not possible to simple replace the WLAN module by the small SSD. The particular slot has to support SATA transmissions in the BIOS and currently, only a few devices are capable of this. Altough this solution is a special solution for particular devices and not designed for the consumer market, we wanted to test the performance of these mini SSDs. On the board there are well-known components, e.g., the X25-M Postville or the Intel X25-V. The same Controller, type PC29AS21BA0, which controls Multi-Level Cell Flash-Speicher (MLC) from Intel, is used. Our test model features five Intel modules (29F16B08JAMDA), each of 16 GB capacity and processed in not absolutely modern 34 nanometer lithography. But this is not disadvantageous for end consumers. 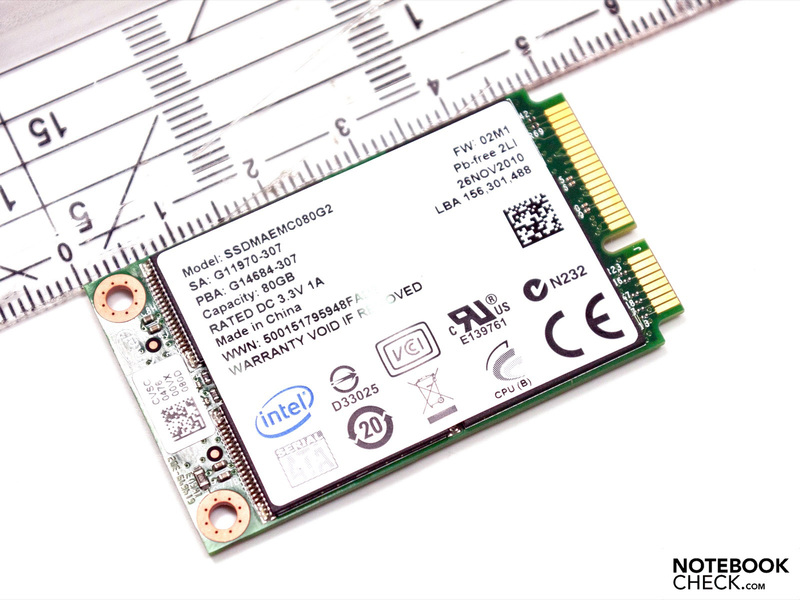 In addition Intel also offers the SSD series 320 (2.5 inch) with modern 25 nanometer chips. The used PCI Express interface limits the transfer rate to a maximum of 3 Gbit/s. Currently, most drives use this standard, which gives a potential data transfer of about 300 MB per second. Intel's marketing information claims that the top model of the 310 series should be able to achieve a maximum of 200 MB/s in reading and of 70 MB/s in writing. The smaller model with 40 GB capacities is said to have a clearly lower performance of 35 MB/s in writing. Being a kind of niche product, you could suspect that this solution is rather expensive. This is not true and a price comparison shows that the Intel SSD series 310 is already offered at 74 Euro (40 GByte) or 150 Euro (80 GByte). The adapter we had does not seem to be included in the scope of delivery. However, it is also not thought to be used permanently. Following the usual procedure we start with the ATTO Disk Mark. Many manufacturers base their marketing information on this benchmark and it delivers reliable results. 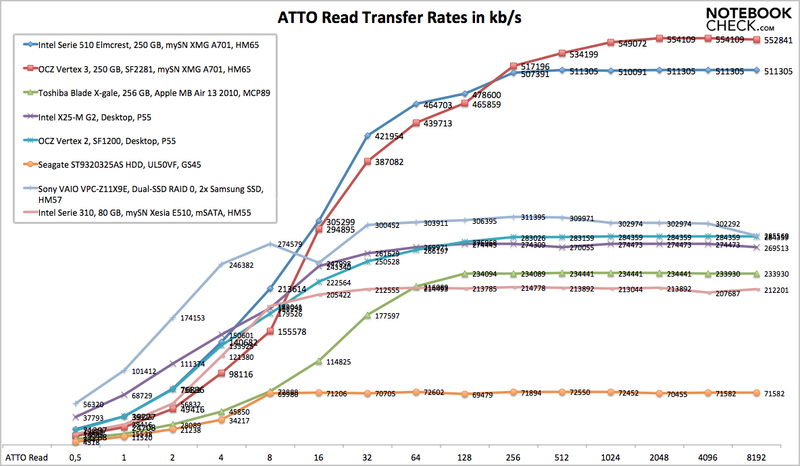 Based on the Intel X25-M the Intel SSD series 310 achieve a maximum read transfer rate of about 215 MB in this test and therewith belongs to the broad midfield of most Solid State Drives. 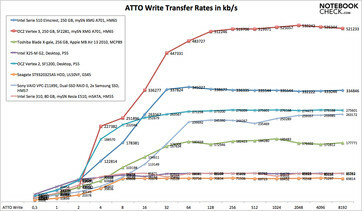 The transfer rate remains constantly on a good level without big outliers from a packet size of 16 MB upwards. 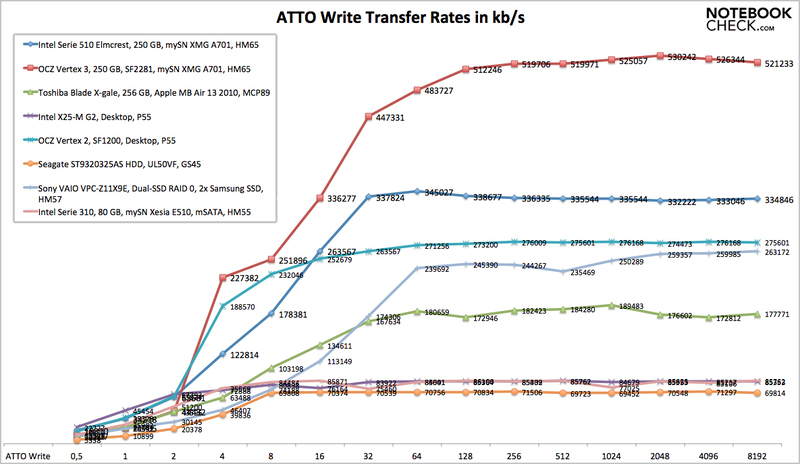 So, it is about on par with the Toshiba Blade X-gale SSD module in the Apple MacBook Pro 13 2010. The Intel X25-M connected to a P55 desktop mainboard is a little bit faster (274 MB/s) and modern SATA-3 drives play in a completely different league. The Intel X25-M and the series 510 with 250 GB are + 21,5 percent and +57.9 percent (511 MB/s) faster. In writing the SSD from Intel is not that fast. According to the manufacturer the maximum transfer rate amounts to 70 MByte per second. 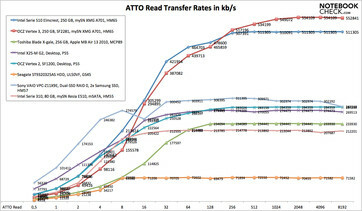 In the Atto Disk Mark our SSD is again better and achieves a peak value of 86 MB per second. The Intel X25-M is on par in this test and not faster. 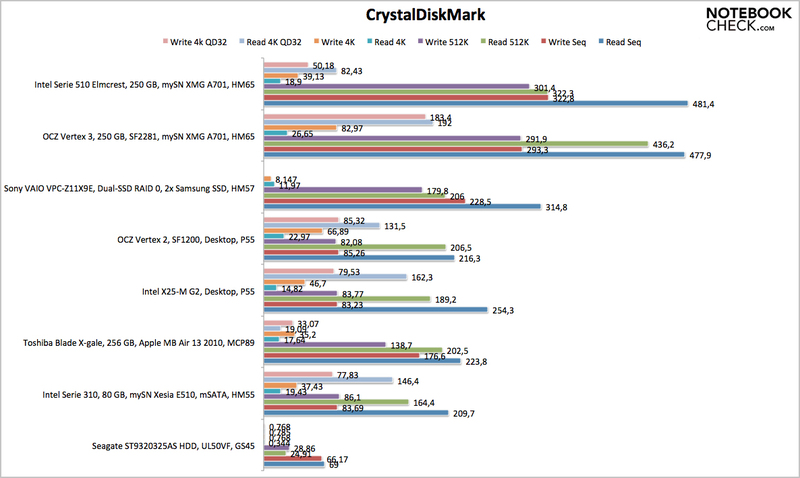 Comparable SATA 2 SSDs, e.g., the Vertex 2 in usual 2.5-inch case offer a better performance. 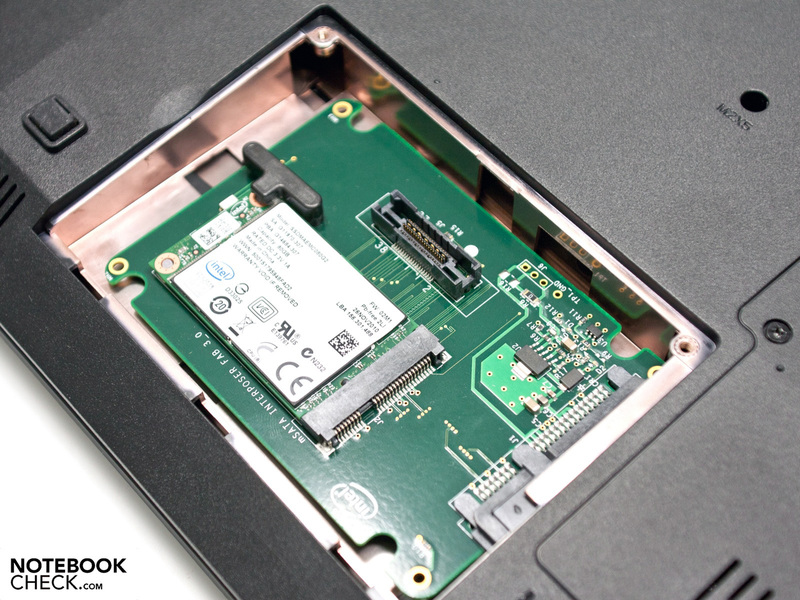 By achieving a maximum of 339 MB/s the Intel SSD Series 510 clearly beats our test model and is 74.6 percent faster. Our next test, the CrystalDiskMark, displays a lot of measurement results. We only consider the 4K read and write benchmark, because this operation is typical in daily use. 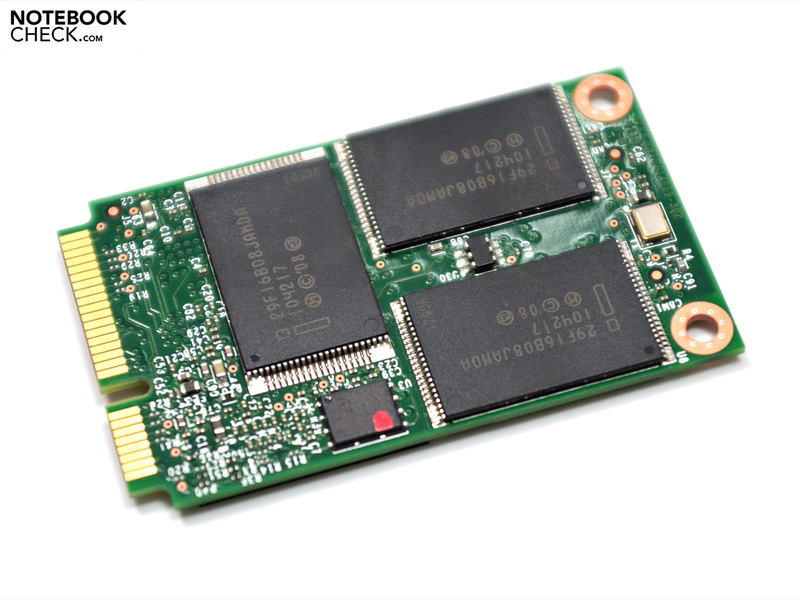 Achieving 39.43 and 19.43 MB per second this SSD offers a good performance in the midfield. Compared to conventional hard drives with 5400 rpm the difference of every SSD is huge. Again, the X25-M is only faster in reading, where it accomplishes 46.7 MB/s (difference: + 15,6 Prozent). 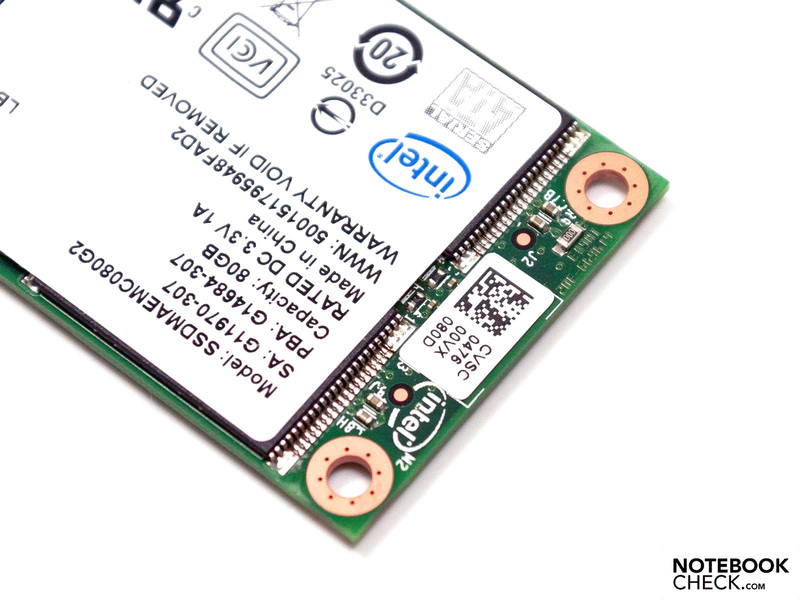 The modern series 510 with SATA 3 interface achieves 39.13 MB and is on par with our test sample. 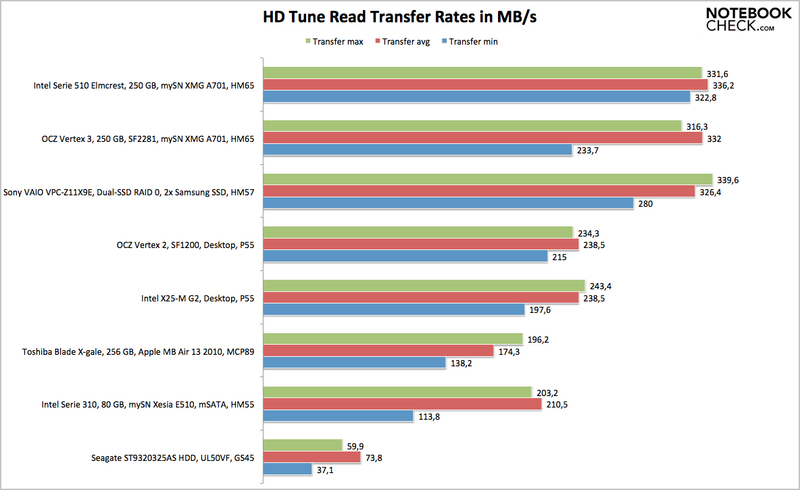 Even though the read benchmark of HD Tune Pro 4.6 has not been developed for Solid State Drives and only results among themselves are comparable, we want to look at its results next. 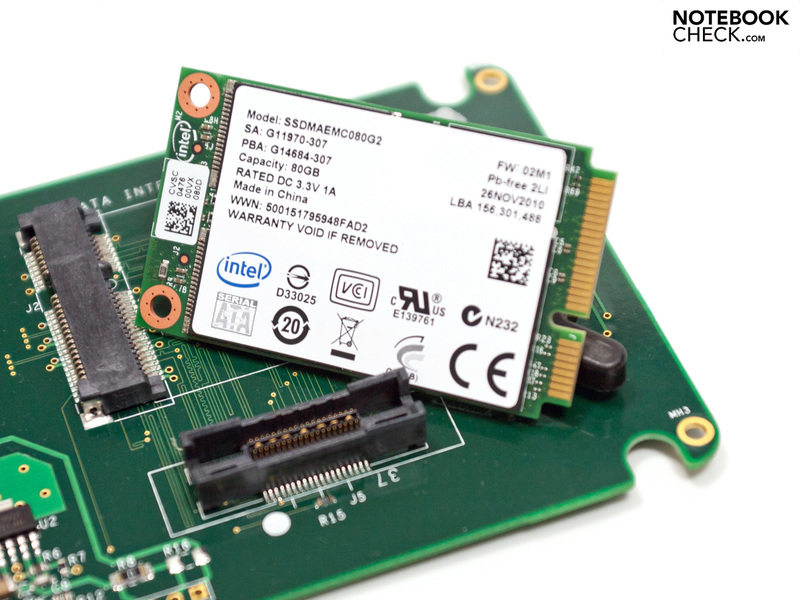 A maximum of 203.2 MB per second means that the Intel SSD series positions itself in the lower third of SSDs. Nevertheless, it offers a good performance. The X25-M and the series 510 with 250 GB capacity achieve 243.4 MB/s (+ 16.5 percent) and 331.6 MB/s (+ 38.7 percent) and are as usual faster in reading. A pro of HD Tune is that it displays a read access time. Conventional hard drives range between 15 and 20 milliseconds. 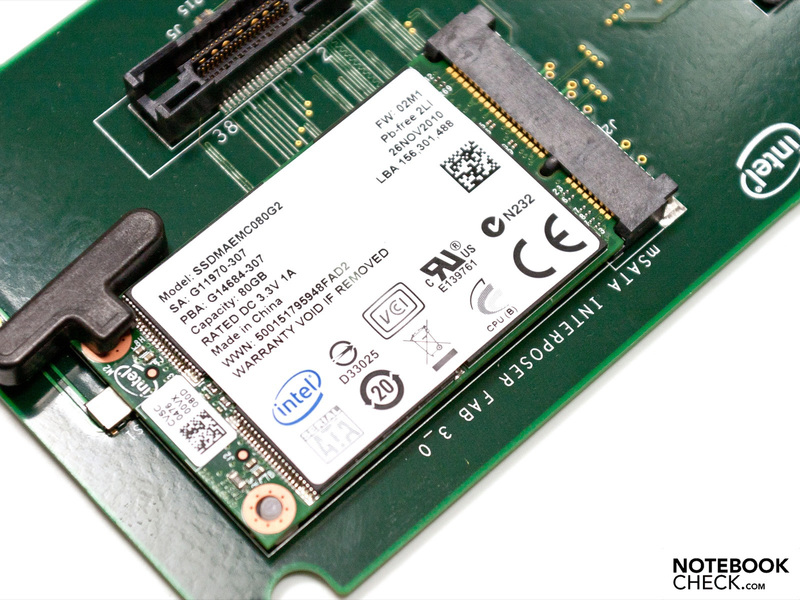 The Intel SSD series 310 convinces with a low value of 0,073 milliseconds and is on par with the fast OCZ Vertex 3. According to our measurements the X25-M is exactly one millisecond slower, but this difference is too small to be of much relevance. 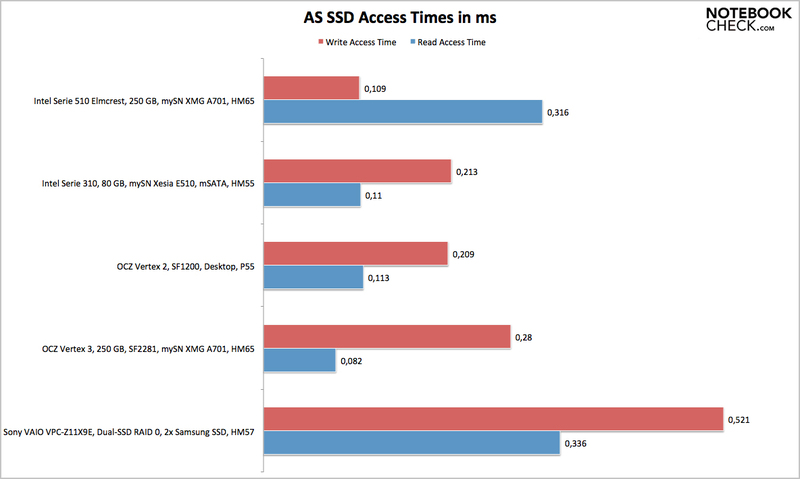 The AS SSD benchmark is ideal for testing Solid State Drives. Just like the CrystalDiskMark its results are reliable and on a similar level. 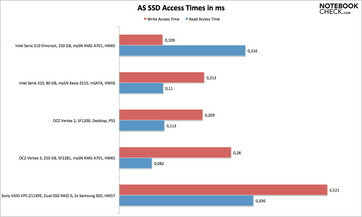 A further feature of AS SSD is the calculation of access times (read and write). The results of 0.11 milliseconds in reading and 0.213 milliseconds in writing are decent. 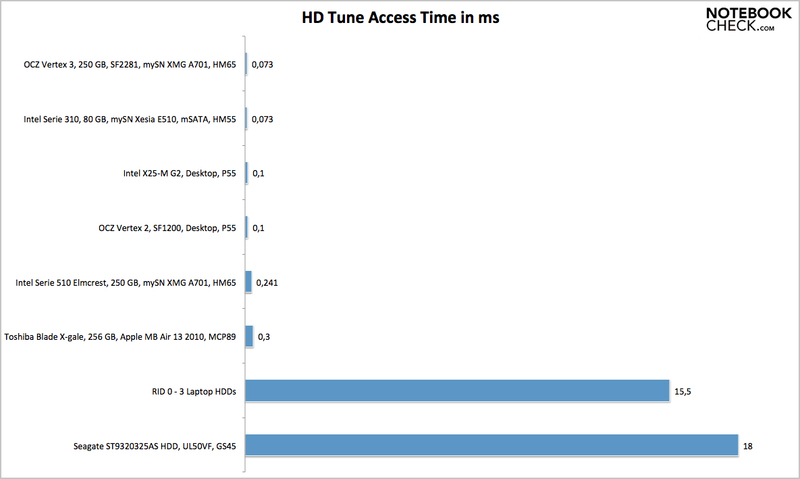 Compared to the results of HD Tune Pro the read value is marginally higher, but this does not have any negative effect. 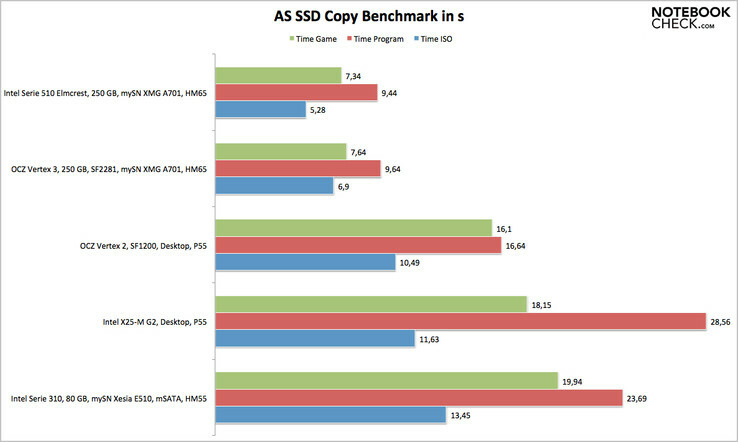 Hidden, but rather useful is the copy benchmark of AS SSD, which simulates a typical use. The Intel SSD test model can not keep up with faster drives in this test and is beaten by the X25-M and the clearly faster series 510. 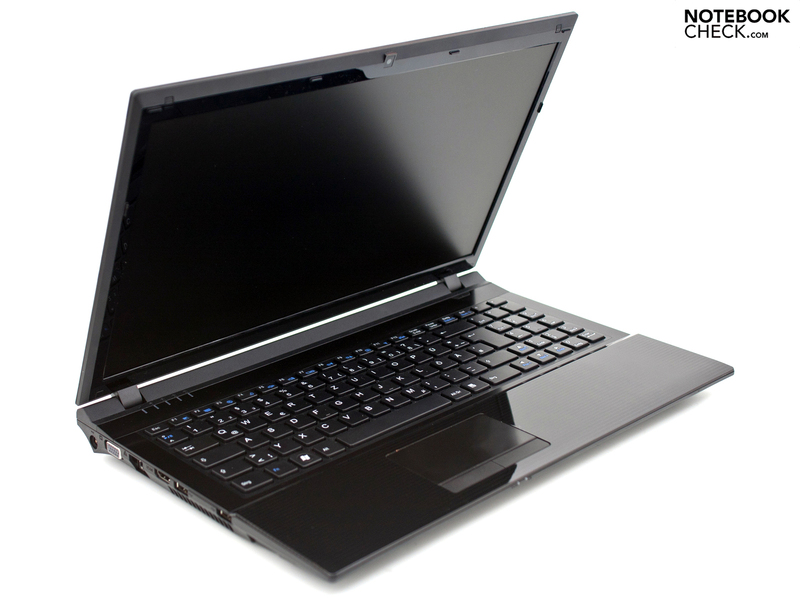 It is noteworthy, that conventional laptop hard drives are clearly slower. 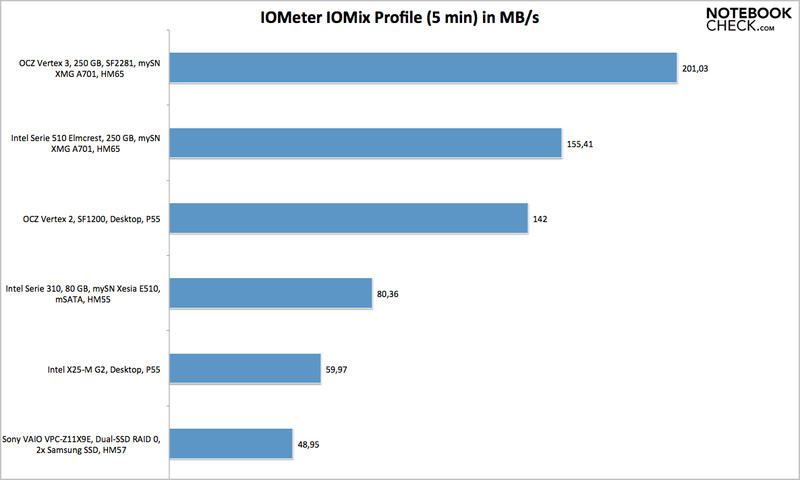 Finally, we ran the IOMeter Benchmark with the IOMix profile from c’t. This setting should also simulate typical use and running it five minutes ensures reliable results. The maximum transfer rate of 80.36 MB per seconds is relatively low. Modern Solid State Drives achieve 150 MB/s and are clearly faster. Interestingly, the bigger Intel X25- M is slower, although the new series 310 is based on the same technology. It only achieves 59.97 MB/s and is 25 percent slower. 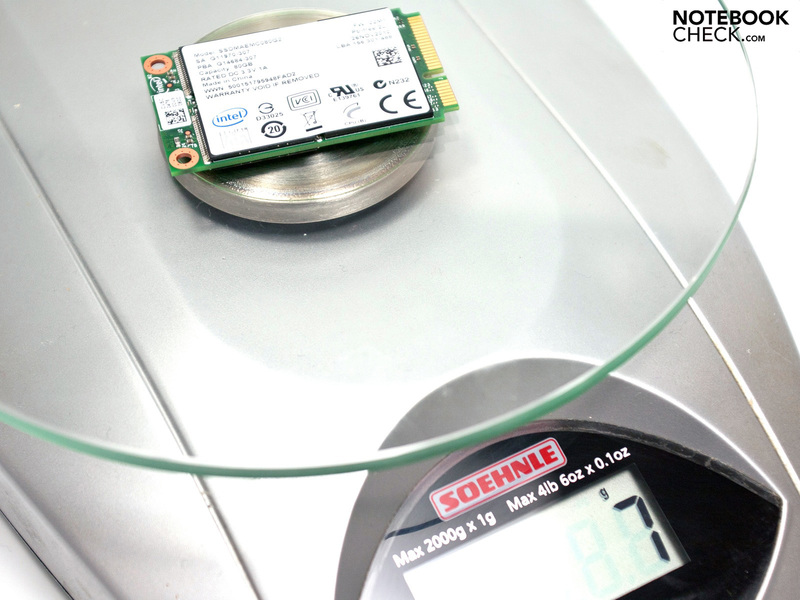 In our previous tests this SSD was better than the small mSATA-SSD for the most part. 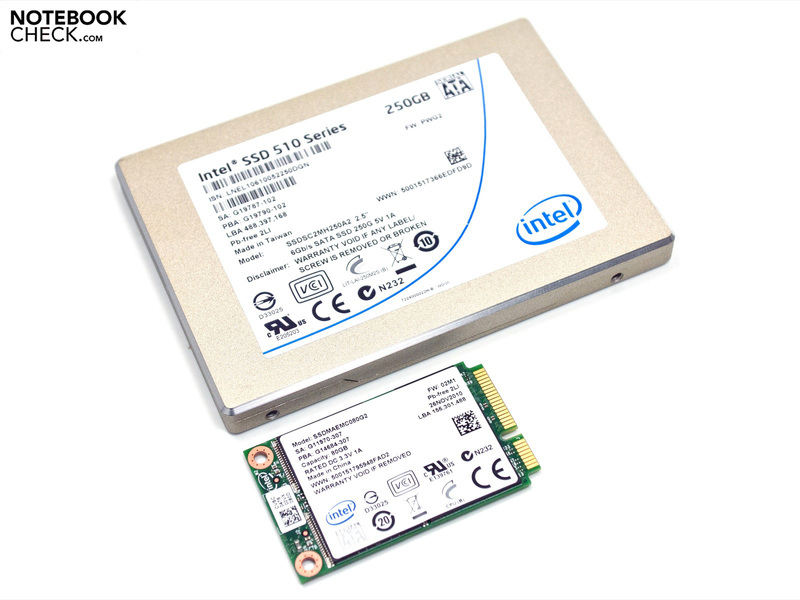 Despite its small mSATA shape, the Intel SSD Series 310 is based on the technology of the bigger X25-M Solid State Drive. 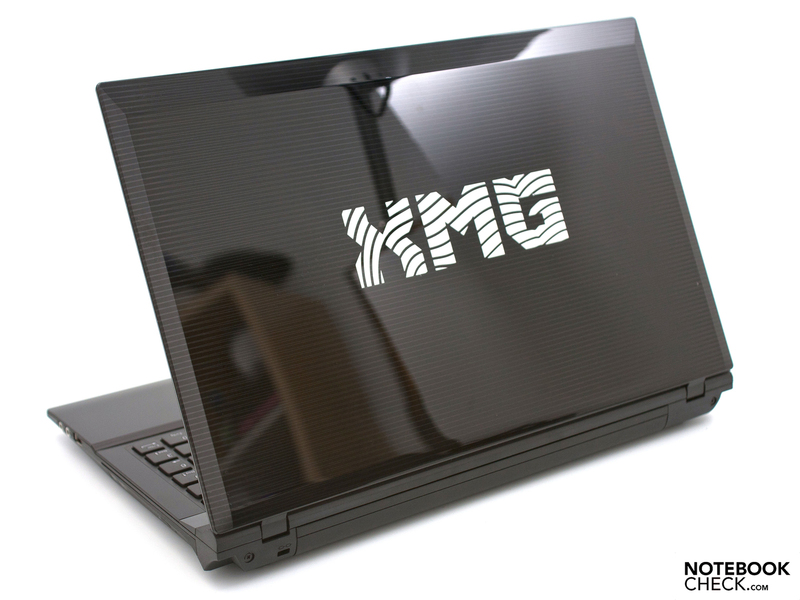 This technology is incorporated an a small printed circuit board, which only weighs 7 gramme and is so very light. This solution is designed for mobile devices with PCI Express Mini card slot, but some requirements have to be met. The slot must be existent and the transfer via SATA supported by the BIOS. So, it is hardly ever possible to use it in a free slot or instead of a WLAN module. 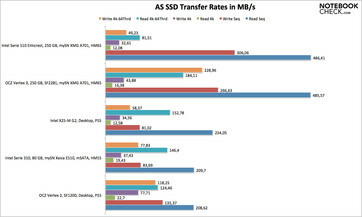 Therewith, the SSD from Intel is nearly a niche product for only few devices and not designed for the consumer market. Currently two models, 40 or 80 GB capacity, are offered. 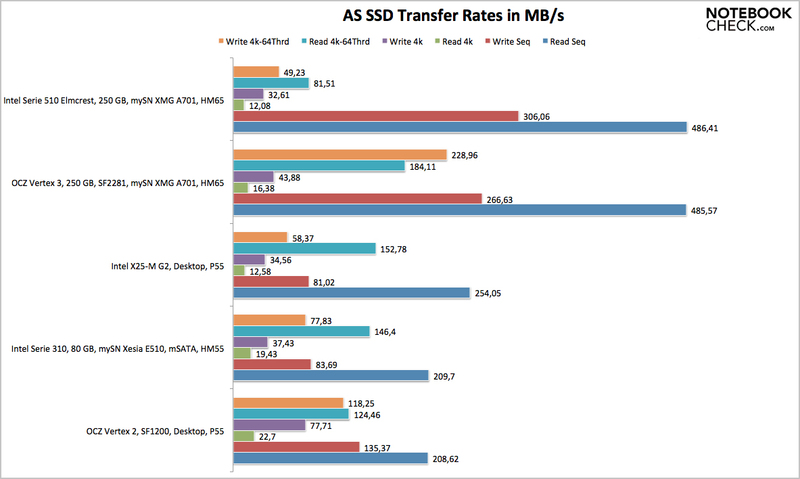 The bigger SSD reviewed by us has a good performance, but is slower that usual 2.5" SSDs. Considering the small size and the low access times, the drive is ideal as system disk and for frequently used programs. In current price comparisons the bigger model costs about 150 euro. This corresponds to 1.86 euro per GB and meets the average costs of SSDs. To summarize: A elegant solution for few systems, which can be useful. 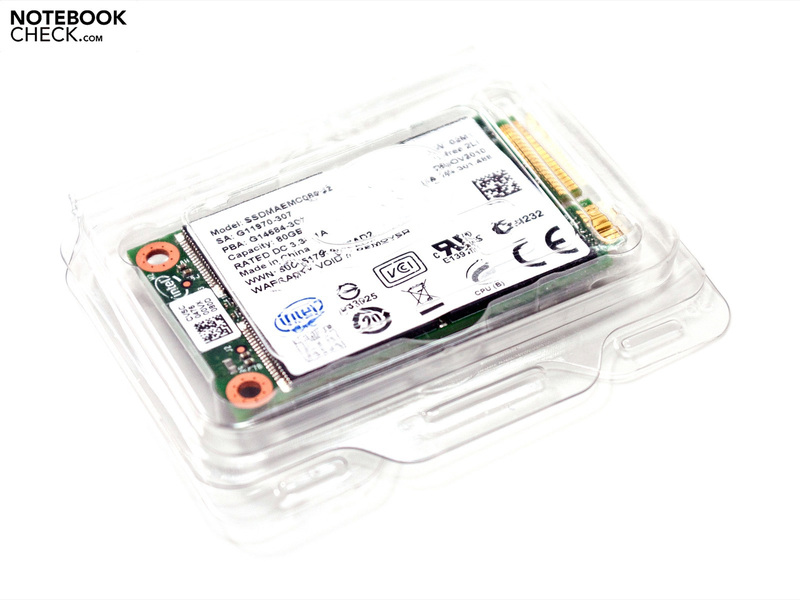 Because of this facts, we rate the Intel SSD series 310 "conditionally recommendable".